While I applaud the principle of both fair trade and organic food production, there’s a part of me that worries when those are the only attributes used to describe a product. 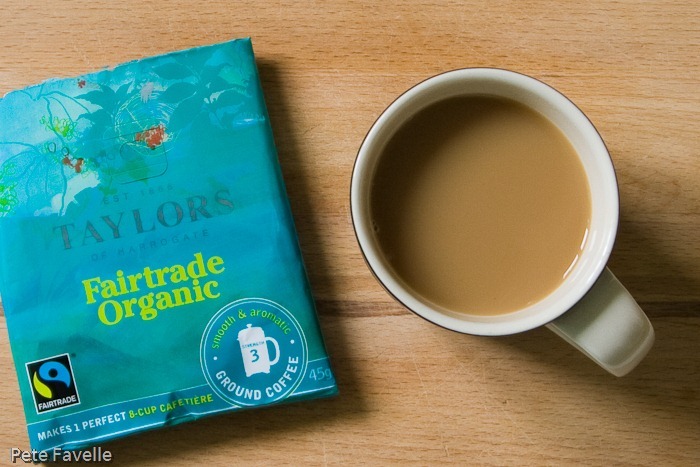 Taylors are a premium mass-market brand, and they’re pretty ethical too – while not everything is under the Fairtrade banner, all their coffee is responsibly sourced through Rainforest Alliance and UTZ certified suppliers. So is highlighting this to the exclusion of every else just a marketing gimmick? Still, perhaps I should judge a coffee by its flavour rather than it’s product name! 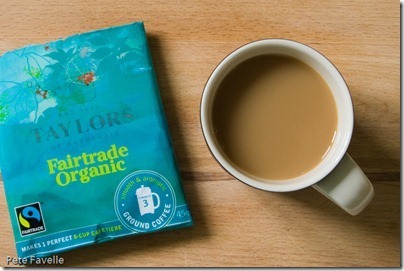 This is Taylors Fairtrade Organic, a medium strength coffee from Latin America. The grounds have a rich aroma with a brown sugar sweetness, a slightly caramel roast and a subtle hint of dried fruit underneath. Brewed, there’s less sweetness and a distinctly lime citrus nose becomes apparent. In the mouth, it’s a decent enough coffee. The body is a little light, and although there’s still a hint of citrus fruit flavours to the taste, that’s more than balanced by a tannic bitterness. Not necessarily a coffee I’d seek out, but I wouldn’t turn it down either. There’s nothing wrong with it, but it’s unexciting – the very definition of a 2 star coffee.